Vedoucí: Ing. Jan Čech Ph.D. The super-resolution is a technique which allows to reconstruct high-resolution image from multiple low-resolution images or a video. A basic principle is registering the images into a common coordinate frame, deconvolution, and final aggregation. An introductory overview can be found in . This technique has natural applications in forensics, e.g. license plate reading from low definition videos , facial image super-resolution [3,4], etc. There exist many different approaches in the literature. A code for algorithm  is included in OpenCV. Faces are non-rigid 3D objects, so the registration is not straightforward. We will provide a code for precise facial landmark detection in the images , which will be a basic tool for the registration. The beauty of this topic is that the final result could be very impressive in the sense that human does not have this ability. Nevertheless this topic is not easy to handle. The work could start from simple experiments with planar scenes, comparing with OpenCV, until the super-resolution of faces with frontal and non-frontal videos of a subject speaking or changing expressions. Therefore this topic can be chosen for semestral, bachelor, or master project. Super-Resolution Image Reconstruction: A Technical Overview. IEEE Signal Processing Magazine, May 2003. Filip Sroubek, Gabriel CristĂłbal, Jan Flusser. A Unified Approach to Superresolution and Multichannel Blind Deconvolution. IEEE Trans. on Image Processing, 16(9), 2007. Kui Jia and Shaogang Gong. 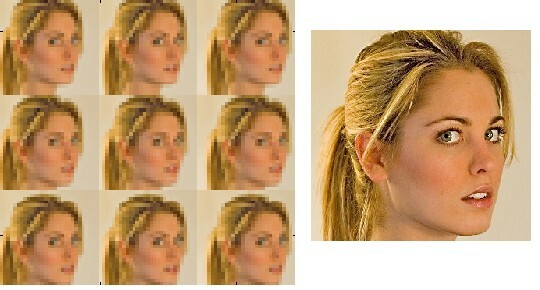 Generalized Face Super-Resolution. IEEE Trans. on Image Processing, 17(6), 2008. Shuowen Hu, Robert Maschal, S. Susan Young,Tsai Hong Hong, and P. Jonathon Phillips. Face recognition performance with superresolution. Applied Optics / Vol. 51, No. 18 / 20 June 2012. Jan Cech, Vojtech Franc, Jiri Matas. A 3D Approach to Facial Landmarks: Detection, Refinement, and Tracking. In Proc. ICPR, 2014.